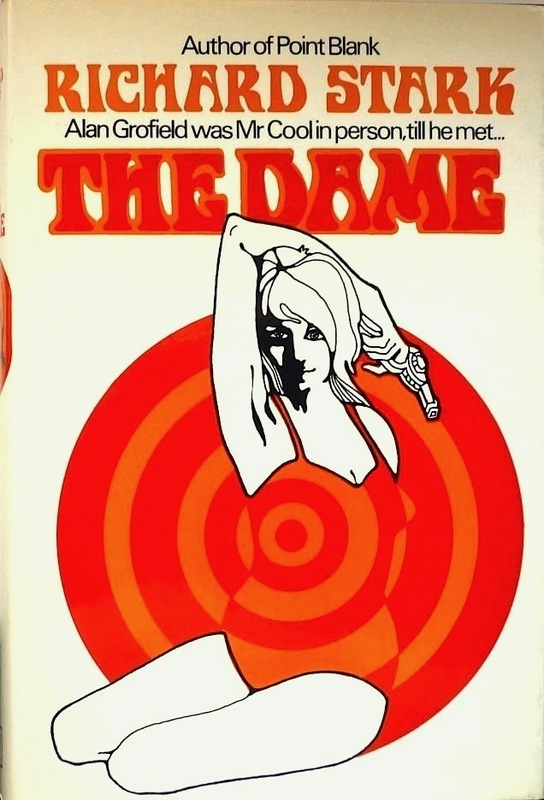 A UK hardback first edition hardback of The Dame, published by Hodder & Stoughton in 1969. 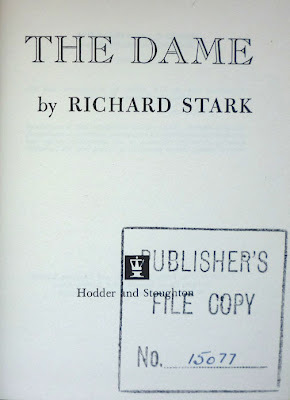 It is, of course, the second of Donald E. "Richard Stark" Westlake's four pseudonymous Parker spin-off novels starring actor-turned-thief Alan Grofield, and was originally published in the States by the Macmillan Company in the same year as the British edition. 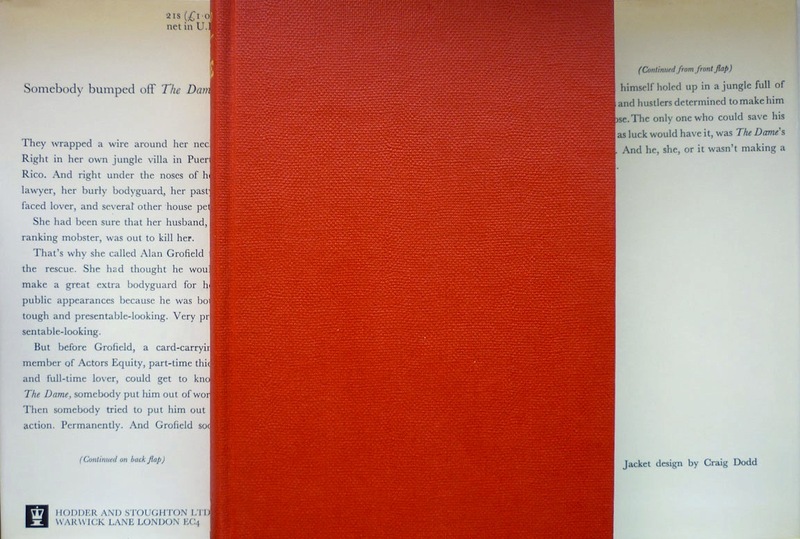 Copies of the Hodder first are very hard to come by – AbeBooks, for example, currently has just one listed, an ex-library copy going for £120 – which is why when I trailed this post last week, I mentioned that we might all be in for a disappointment as regards the dust jacket. 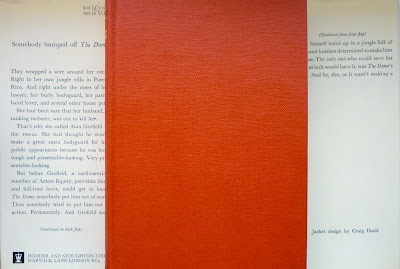 Reason being, I hadn't seen the cover when I bought this copy (for rather less than £120, I hasten to add), and so didn't know if Hodder had simply taken the US jacket artwork. Turns out they didn't, instead assigning the cover to Craig Dodd, who also designed the wrappers of the 1979 Jonathan Cape first edition of Tom Wolfe's The Right Stuff and, less appealingly, the 1980 Hamish Hamilton first of Isabel Colegate's The Shooting Party. It's interesting to compare Dodd's cover design to Muni Leiblein's artwork for the US Macmillan edition of The Dame. 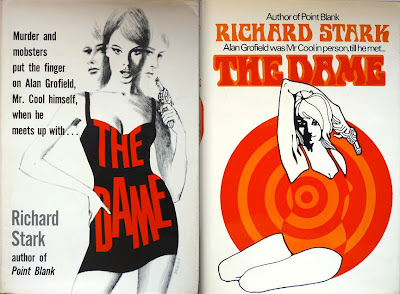 Both opt for a dame – naturally – holding a pistol, but whereas Leiblein's broad is sketched in pencil and has the book's title emblazoned across her dress (shades of Michael Gillette's much later covers for the 2008 Penguin editions of Ian Fleming's James Bond novels there), Dodd's dame is composed of heavy black lines, her swimsuit picked out by the reversing of the orange and red concentric strips. 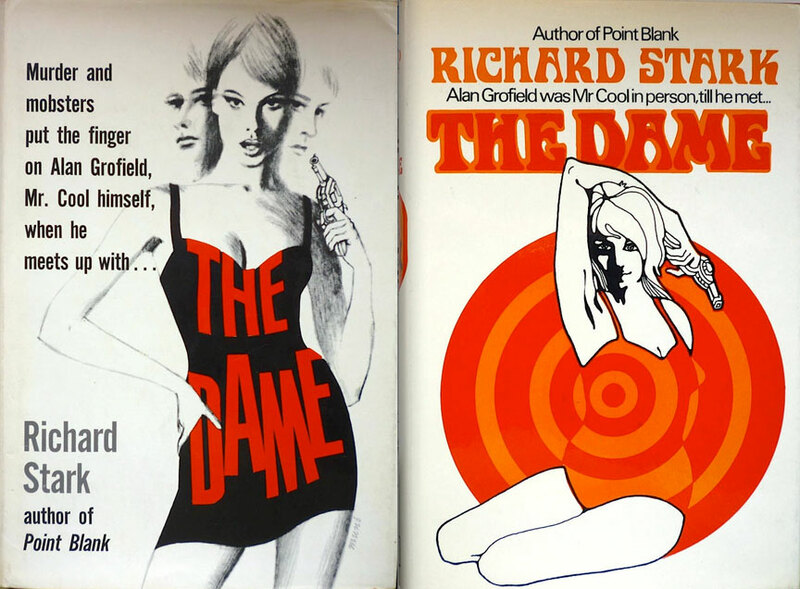 Of the two, I think I still prefer Leiblein's cover, but I do like Dodd's jacket, especially the psychedelic font used for the author name and title – echoed in the strange gun in the girl's hand – and that red-and-orange target. Making it a one-of-a-kind item. Wow, what a stunning book. 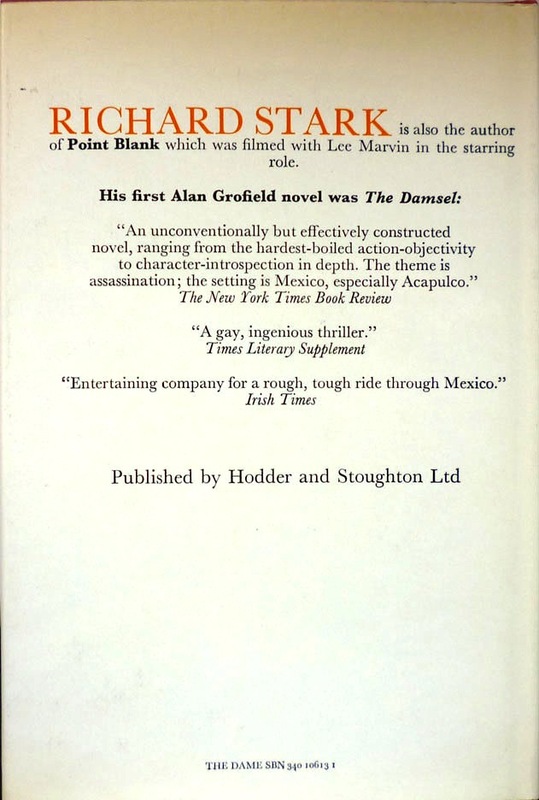 When I was hunting down the Grofield's I had enough bother finding affordable copies in paperback! 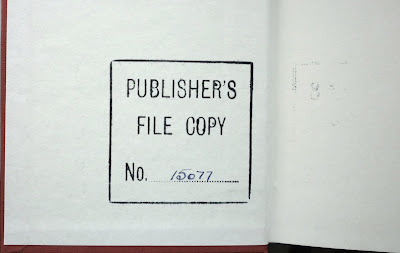 Bit of a random question, do you have a catalogue/record of all your books and their origins? What do the numbers tot-upto? Is there anything still on your wishlist or are you fully stocked up? Neither cover tells you much of anything about the story, but that's pretty much typical of all the Grofield covers. It's like they didn't really know how to sell these unconventional crime books, so go with the tried and true. I've nearly finished reading Westlake's 'Nephew' books of the 1960's, that started off with "The Fugitive Pigeon." (Originally titled "The Dead Nephew", before the publisher nixed that). All fun reads, some much better than others, and all somehow not quite satisfactory--experiments--variations on a theme, as Westlake tried to figure out how to write first-rate comic novels, which in many ways is the hardest thing a writer can attempt. He was writing short stories in a farcical vein as early as 1960, so this was clearly something he really wanted to master. He didn't nail the form until "The Hot Rock", but I've realized something--the first three Grofields are his attempt to write Nephew stories in the Richard Stark voice. Grofield is simply a more confident and competent version of the Westlake Nephews. This is particularly true of "The Dame" and "The Blackbird", where he's basically put in an impossible situation where people are constantly misunderstanding his role, and suspecting him of things he's quite clueless about. Being a Stark character, he already knows who he is, so there isn't the same process of self-discovery you get in the Westlake books. Which is why they don't work as well. Grofield should never have been in these crazy situations to begin with. He's out of place. 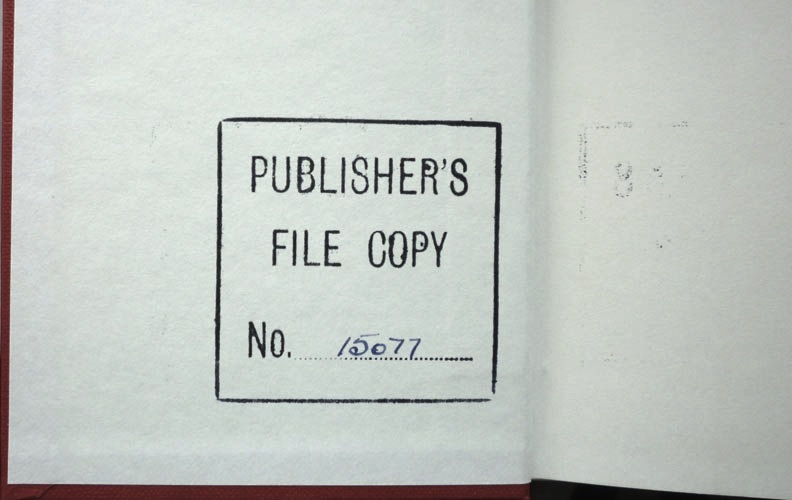 Col: I don't have a catalogue of all my books, and I've no idea how many I have – hundreds, certainly, possibly thousands. Still plenty of stuff on the wishlist though – P. M. Hubbard, Desmond Cory, Patricia Highsmith, Westlake and Stark of course... it's an extensive list! Chris: Interesting theory re the Grofield novels. 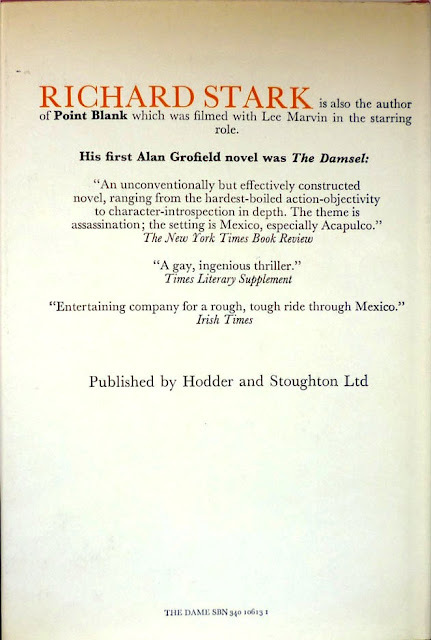 My own notion in my reviews of the novels was that Westlake was trying Grofield out in various roles to see which would fit – an adventurer (The Damsel), an Agatha Christie-style detective (The Dame), a spy (The Blackbird) – but that doesn't negate your idea. I think it was less that he was trying to find out what Grofield could do as that he was trying to figure out what HE could do, as a writer. Westlake tirelessly kept exploring ways to tell the same story better. He's selling all these books, but he knows some work much more than others. He's trying to figure out why. One way to do this is to put different types of character in the same situation, and see which works better. I agree with your interpretation of the Grofields--each is set in a somewhat different genre from the previous one--but reading the books Westlake wrote under his own name during the same period, I couldn't help but notice the parallels. 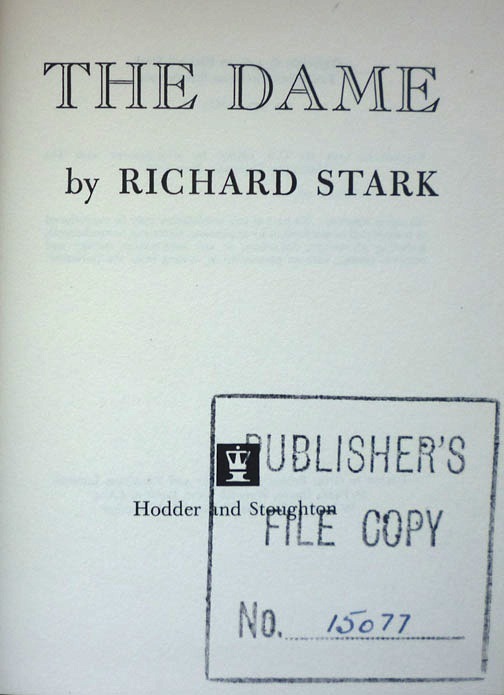 What he writes as Stark influences what he writes as Westlake, and vice versa. And of course he's writing as Tucker Coe as well in this period. In the 60's and early 70's, he was really trying to figure himself out (well, that's kind of what everyone was doing then, I guess). Parker was the first thing he did that 100% worked--it all came together in the first book in a remarkably organic self-contained way, and he wanted to see if he could do that again (most writers only ever do it once, of course--if that). Then came Mitch Tobin, a fascinating but self-limiting character, who Westlake figured he either had to abandon or ruin--he chose the first option. As Westlake, he increasingly turned to farce, but it's just so much harder to master that. What's so striking about the first three Grofields is that this is a professional thief, and he doesn't steal anything. The other 'Nephews' are just harmless schlemiels caught up in situations beyond their control, who all go through some kind of transformation in the process of figuring out how to survive. Grofield already knows exactly who he is, and doesn't learn anything in the course of these stories. He ends them in exactly the same condition that he began them. Even Parker changes more than Grofield. Grofield's limitation as a character is that he really has nothing to tell us. He has no hidden depths to guess at, like Parker. He has no inner conflicts to work out, like Tobin. He has no voyage of self-actualization, like the Nephews. And because he's so self-conscious, he's just not as funny as Dortmunder.